15-year old Indian students, who were put through a two-hour international test for the first time, stood second last among 73 countries, only beating Kyrgyzstan when tested on their reading, math and science abilities. In contrast, 25 per cent of the 15-year olds in Shanghai demonstrated advanced mathematical and thinking skills to solve complex problems. The desperate situation calls for a new Right to Education Act. It is a tautology that something that cannot work will not work. How true this has been for the Right to Education Act (RTEA)! It was said when it was passed a few years ago that it was unimplementable. And, as was expected, no provision of it has been so far implemented. The middle class is forced to send their children to English medium fee-charging private schools as they are convinced that there is no future for their children in poor-quality government-run schools. On the morning of Thursday, March 8, when my daughter came to find out if I had a restful night, I asked her, “When is Holi?” She looked somewhat surprised as if I had gone bonkers and replied: “Today is Holi”. Punjabi cinema comes of age — at last! Being on the jury for the 59th National Film Awards was a particularly exciting privilege and I have to say that it was both enjoyable and educational. To be able to take two weeks off and just sit back and view the best cinema being produced in the country is an opportunity not to be missed — and quite honestly I would be happy to do it all over again! 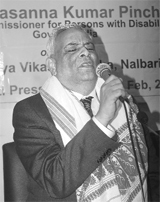 In late December last year, Prasanna Kumar Pincha became the first person with disability to be appointed by the Government of India as the Chief Commissioner for Persons with Disabilities. An outstanding rights activist, he is visually disabled since his birth. The grand old man of Indian arts, Syed Haider Raza, has just celebrated his 90th birthday. 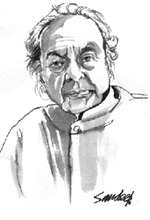 He became India's priciest modern artist on June 10, 2010 when a seminal work, "Saurashtra", was sold for Rs. 16.42 crores at a Christie's auction. Most of the government schools still lack basic amenities like desks, chairs, toilets and teaching aids. Let us look, as examples, what has happened or is happening, in contrast to what should have happened if the Act were implemented. RTEA says that admissions in private schools should be conducted only through lotteries or some equivalent random process of selection to avoid discrimination. According to the New Indian Express, Hyderabad, managements of virtually all private schools (with the few exceptions of non-profit-making private schools) in Hyderabad are flouting this norm and conducting tests for both parents and children, now that it is admission time and some 1.5 lakh parents are seeking seats for their little ones in the city’s so-called ‘better’ private schools. These schools also demand capitation fees, which the parents are ready to shell out ‘if the school caters to their requirement’. Let me quote two instances reported in NIEH. In the first instance, the irate parent says, “My child could not make it to a prestigious school last year as they demanded a sum of Rs.1 lakh after assessing my husband’s annual income. We decided to get her admitted to a nearby school. They charged Rs. 30,000 per year. This year we plan to go in for admission to the second standard in the same school”. In the second instance, the parent says, “My son has good communication skills but the interactive session was hardly anything beyond the few set questions on numbers and colours, apart from daily routine. I feel that the purpose was to estimate the amount me and my husband were willing to spend for a seat. It was humiliating, to say the least. We had little choice but to shell out Rs.65,000 for admission to pre-primary, as it is the only good school close to Madhapur,” where they lived. The irony is that the schools defend their above action openly, making statements such as, “The lottery system or that of first-come-first-served does not take into account the family” or “School is about grooming and not about Chemistry and Physics” (make out what you wish of that!). Management of one school says, “We look at parenting skills of the family and, for the child, we look at normal development, hand-eye coordination and basic etiquette such as saying ‘thank you’, during interactive session”. Worse is the fact that the parents, who can afford to send their children to expensive private schools, too, are in favour of having their children screened. A majority of them are ‘perturbed by the system of lottery instead of written examination for testing’. “And how is it fair to the child who is better?”, they ask. Parents, who send their children to expensive private schools are also worried about the children coming in contact with the children of poor families if they are admitted according to the 25 per cent quota prescribed for them by RTI. “What if our children pick up bad habits from them? Is it fair that we pay a large sum of money for admission to a premier institution, and they avail the service for free ?”, asks a parent, whose daughter studies in an international school. “I send my son to a prestigious private school. Where will children from economically weaker sections fit in, in such an atmosphere ? Such a move will dilute standards”, says another parent. And in Khammam, where a survey was carried out recently, 76 private schools are running without a permit. Let us now look at the Government schools. The RTEA was supposedly designed to make Government schools as good as the better private schools, so that even the affluent would want to send their children there as they would be free. After all, the Central Schools run by the Government of India are amongst the best in the country, with children of all social strata going there, as long as their parents are in a transferable Government job. Sixty-four per cent of the schools in Andhra Pradesh do not have toilets. So, the girls either do not go to school or learn to hold their thirst. The RTEA emphasised construction of toilets in every school but, perhaps, not one toilet has been added in the last few years in the existing government schools after the RTEA was passed. Leave aside toilets, virtually all government schools (excepting Central Schools) lack even basic facilities like chairs, benches, drinking water, a good (not dilapidated) building, enough rooms and teachers. No wonder a school building in the old part of Hyderabad city collapsed in July last, injuring five students. No surprise, then, that many schools have few students. Even the poor cut down every other expense – including that on basic necessities – to send their children to the mushrooming private schools, which have a shine and charge high fees but may not be imparting any better education than the unsatisfactory government schools. Some crowded areas in cities like Hyderabad do not have enough number of even bad government schools to take care of all the children in the area. Let us now look at the products of the government schools. Some 71 per cent of the students of Class VIII in the rural schools of Andhra Pradesh cannot divide. Some 42 per cent of them cannot subtract. And 55 per cent cannot even read a Class II Text Book. These are some of the findings reported in the Annual Status of Education Report 2011. The same report says that less than a third of class III students in rural Indian schools can solve simple two-digit subtraction problems. There has also been an alarming decline in mathematical skills, in the number of children in Class V that are able to read Class II books, and in attendance, over the last year. At the international level, 15-year old Indian students, who were put for the first time on a global stage, stood only second last, only beating Kyrgyzstan when tested on their reading, math and science abilities. India thus ranked second last among 73 countries that participated in the programme for international student assessment conducted annually by the OECD to evaluate education systems world-wide. The survey was based on a two-hour test that half a million students were put through. By contrast, ‘more than one quarter of Shanghai’s 15-year old demonstrated advanced mathematical and thinking skills to solve complex problems compared to an OECD average of just three percent. And we want to be counted in the same league’ as China! It is abundantly clear that we need a new Right to Education Act, which would be implementable and in the interest of all the citizens of the country. The new Act must recognise that if we wish every child in the country to grow up to be a fully responsible citizen, there is no alternative to de facto de-commercialising school education and resorting to a common (neighbourhood) school system, where parents (irrespective of their social status or circumstances of birth) living in a particular locality will have an obligation to send their children to a particular neighbourhood school. It is only when children of the affluent and privileged go to a government school that there would be enough pressure on the authorities concerned to improve the school in terms of facilities, teachers and standards, as has happened in the Central Schools. The middle class is forced to send their children to English medium fee-charging private schools as they are convinced that there is no future for their children in poor-quality government-run schools. The most glaring fact is that even those manning (Teachers and other officials ) Government-run schools are also sending their children to these private schools as they are equally convinced that there is no future for their children in their own schools. Despite the constitutional right of every child to free education, the middle class is forced to part with nearly 35% of its hard earned income in providing education to its children in private schools. It is not out of free will. Allow admissions in Kendriya Vidyalayas to all their children and then find within the next 48 hours that more than 50 per cent of the parents withdrawing their children from private schools and sending them to KVs. However, it is not happening due to deliberately designed anti-people, unconstitutional, arbitrary and discriminatory laws and policies of the Governments. The unjust, arbitrary and exorbitant fee-hike every year by the private schools has put the middle class in great financial difficulties as it is becoming un-affordable for them. The middle class is agitating all over the country on this issue but without any solution in sight and therefore, the crisis is bound to grow in the coming days. The Right of Children to Free and Compulsory Education Act, 2009 (RTE Act, 2009) has provided limited opportunity to the children belonging to disadvantaged groups and economically weaker sections to receive free elementary education in recognised private schools to the extent of 25% of seats at the entry level class. It has certainly raised aspiration among the poor and disadvantaged people to get their children educated in English Medium Private Schools. However, such aspirations for most of them would be elusive as all the children are not going to get admission in these schools. It is already resulting in growing unrest among them. On one hand, for various reasons, the demand for quality government schools is increasing among the masses and on the other hand, Governments have miserably failed to meet this demand. It is all resulting in growing anger among the masses. It is manifest from the agitations being resorted to by the parents and the students demanding their right to quality school education in different parts of the country. All the parents sending their children to private or government schools are victims of the present education system, cleverly designed to exploit them in one way or the other. In earlier days I never had to ask such silly questions. I was awakened by shouts of boys yelling “Holi Hai!” In any event I was full of anticipated excitement with pichkari, buckets of red water and packets of gulaal ready to join revelers in the house of Lala Raghubir Singh Jain in Kashmere Gate. He was founder of Modern School. Since I have gone deaf, I am no longer awakened by cries of Holi Hai. And in any case, the festival I looked forward to celebrating rubbing gulaal on faces and bossoms of young girls has ceased to excite me. I spent this Holi wrapped in a shawl. Holi used to mark the end of winter and time to get into ‘T’ shirts and shorts. Years have taken their toll. Holi was the one festival I looked forward to enjoying. Now it is the festival I most dread. The thumping majority with which the Shiromani Akali Dal returned to power in Punjab reminds me of an anecdote Gyani Zail Singh narrated to me. He was canvassing for the Congress Party when he came across a Sikh peasant seated on his charpoy, smoking a hookah. His beard was trimmed. Gyaniji tried his best to get him to vote for the Congress. But the peasant was adamant. “Vote taan main panth noo paoonga (I will cast my vote for the panth)”. Gyaniji lost his temper and said: “Panth, panth kee layee hoee hai (what is all this you talk about the panth? You have a tootee (hookah pipe) in your mouth, darhee teyree munni hoi hai (and your beard is trimmed)”. Unabashed, the peasant replied: “Gyaniji, darhee taan apnee munni hai, panth dee taan nahi munni (I have trimmed my own beard not of my Panth”). A government employee of India was sitting in his office and out of boredom, decided to see what was inside his old cabinet. He poked through the contents and came across an old brass lamp. “This will look good on my mantel”, he said, and took it home with him. While polishing the lamp, a genie appeared and, as usual, granted him three wishes. “I would like an ice cold lassi right now”. He gets his Lassi and drinks it. Now that he can think more clearly, he states his second wish. “I wish to be on an island with beautiful women, who find me irresistible”. Suddenly he’s on an island with gorgeous women eyeing him lustfully. He tells the genie his third and last wish. “I wish I’d never have to work again”. A teenage boy had just passed his driving test and inquired of his father as to when they could discuss his use of the car. His father said he’d make a deal: “You bring your grades up from a ‘C’ to a ‘B’ average, study your Bible a little and get your hair cut. Then we’ll talk about the car”. After about six weeks, his father said, “Son, you’ve brought your grades up and I’ve observed that you have been studying your Bible, but I’m disappointed you haven’t had your hair cut”. Of course it was made much more interesting by the presence of my convivial co-jury members which included the well known actresses Rohini Hattangadi (the chair of the jury) and Aloknanda Roy, directors Vinay Shukla and K.P.Kumaran, cinema critic and historian Latika Padgaonkar, as well as film makers and academics such as K.Hariharan, Prakash Belavadi and Ranjani Mazumdar. The fact that such a disparate group was locked in together for nearly twelve to fourteen hours every day might have spelt trouble — but it didn’t because we understood that we had a common cause, i.e., to champion and seek out the best of Indian cinema .And it became an exciting quest fuelled by a steady supply of tea, coffee, food and snacks, courtesy the Information and Broadcasting Ministry. So we simply put our feet up and dived into that magical world which, as has been often said, allowed us to ‘dream’ together, for a few hours — and view over fifty films. It became obvious , quite soon that the more innovative and stimulating films are being made in regional cinema and thus it was no surprise when we chose two regional-language films jointly for the best feature film award. Byari, a film in the eponymous language, and Deool a Marathi film, both swept us away with their sheer boldness, chutzpah and energy . And while I was really happy when we agreed that Vidya Balan should get the best actress award for The Dirty Picture it was equally thrilling when the the best supporting actress award was given to a little known young woman, Leishangthem Tonthoingambi Devi, for her role as the sister in the Manipuri film, Philjee Mani. So, this unearthing of treasures from the states became the most fascinating part of the screenings. Two other films which especially stood out (for me) were both debut presentations from young directors, the Tamil Aaranya Kandam and the Punjabi Anhe Ghode Da Daan. Made in the neo noir style, Aaranya Kandam directed by Thiagrajan Kumararaja, served up a deadly, clever cocktail of a gang battle ending in bloodshed. Fabulously shot and conceptualized, using music in a very evocative fashion, it was head and shoulders over most other films — and unique because this genre has not been really explored in India and especially not in Southern cinema. Both Aaranya Kandam and Anhe Ghode Da Daan also went a long way in breaking many stereotypes . Aaranya Kandam especially showed the firm and confident hand of a debut director who, while paying his homage to Quentin Tarantino was also able to use a large ensemble cast (that included Jackie Shroff) and pepper the story with humour and pathos, creating the analogy of the urban jungle where lives are meaningless. Indeed , many of the films this year dealt with declining social and political values, with the twin issues of corruption and the misuse of religion and religious symbols dominating thematically. It was a reassuring indication film directors are bravely evading the song and dance trap, choosing to create thought-provoking cinema, instead. Similarly, the low budget, NFDC-produced film which walked off with many of the accolades was Anhe Ghode Da Daan. It is completely contrary to most Punjabi films thus far made, relying neither on the obsequious bhangra or the gurbani or any of the usual tropes in the story telling. Indeed, the film is sensitively crafted and based on a book by Jnanpeeth award winner, Gurdial Singh, using real locations at a village near Bhatinda and in the city itself. Good cinematic adaptations from literature are notoriously difficult to achieve but the director, Gurvinder Singh, has reached into the heart of the novel and given us a film which is both reflective and absorbing. As a Punjabi, I am very pleasantly surprised: the film is edgy and modern, with fabulous cinematography (for which Satya Rai Nagpaul has won the award; it has also won the prize for the Best Punjabi Film) even though it revolves around the fraught theme of migration : both rural and urban. 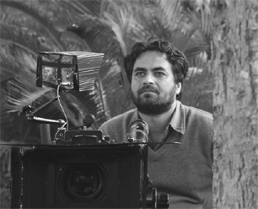 The director, a graduate from the Pune Film and Television Institute has dedicated the film to Mani Kaul, who tragically died last year but it is Gurvinder Singh’s own vision and personal story telling that makes a very difficult and poignant subject come alive. It is also refreshing to see an authentic Punjab village on screen and not the Bollywood-ised version from films such as Dilwale Dulhaniya Le Jayenge. It seems that this, too, was one of Gurvinder’s primary objectives! His filming of life in rural Punjab ( I could relate to every scene!) is convincing even as the tension of impending tumultuous change hovers over the protagonists. Using real life actors is not an easy process, but was a very crucial decision –as this is a subaltern story perhaps told best by non-actors. The on-screen faces, wrinkled with age and experience, are beautiful and unusual. These have been largely ignored by popular films shot in Punjab — as the producers of the latter kind of cinema would prefer to rely on white wigs and enormous amounts of grease paint on actors such as Dara Singh and Kirron Kher. Only the lead actor, Samuel Johnson is apparently a professional stage actor. The film has deservedly picked up other awards as it does the rounds of the film festivals. I have just learnt that it has also got the $50,000 Black Pearl Trophy at the Abu Dhabi Film festival and has already been screened at the Venice film festival as well as the London Film Festival and no doubt will continue to win praise for the director. I do hope it heralds the coming of age of Punjabi cinema and that Anhe Ghode Da Daan is a turning point. In a cinematic landscape peppered with fake sardars played by everyone from Chintu Kapoor to Farhan Khan (even if brilliantly executed!) it is reassuring to hear the actual rhythm of the language and see a well-constructed narrative set in a genuine Punjabi village. Founder principal of the Government Institute for the Blind in Jorhat (Assam), a former Joint Director of Social Welfare of Government of Assam, former Regional - Senior Manager of ActionAid (an international NGO) in North-East India, he was also associated with the National Human Rights Commission as a special rapporteur. A Law Graduate and a Masters Degree holder in English, Pincha hails from Jorhat and is the youngest child in a family, which had migrated to Assam from Rajasthan over 200 years ago. He set up the first school for the visually disabled in North East India in 1973, with the help of local philanthropists and the institution was later taken over by Government of Assam in 1981. Are you satisfied with the implementation of the 'Persons with Disabilities Act, 1995' ? So far only 14 states in the country have appointed full-time Disability Commissioner though the Act came into force in 1996. That indicates that an important Act passed by the Parliament has not been given proper importance by many states. Since I assumed charge as the Chief Commissioner, I have travelled to only Karnataka and Assam to have a first hand experience of the implementation of the Act. Information I have, indicate that Tamil Nadu not only has a separate department but also a separate ministry under the charge of the chief minister to look after disability issues. Karnataka can be placed in the second position after Tamil Nadu. But otherwise, the state of affairs is pretty break. The situation is as bad in Odisha as in Assam. What are the main areas of concern ? The key issues are providing education, social security, employment and barrier free access to persons with various disabilities. State Governments have largely been indifferent. The Assam government, for example, did not identify government jobs (posts) to be reserved for persons with disabilities till 2005, and when it did, it identified very few posts. Section 33 of the Act says government institutions including PSUs have to reserve three per cent jobs for some special category disabled persons in A, B, C and D category posts. Section 32 of the Act says the list of jobs identified as reserved for disabled persons have to be notified afresh and updated after every three years. But the ground realities are very different. In Assam, the state government just appointed a full-time Commissioner for Disability and staff are yet to be appointed. Can we ignore a law passed by the Parliament just because it is related to disabled persons ? There should be an access audit in the country to find out the status of barrier free access to various government buildings, public places and public transport systems for persons with disability. Does the private sector play any role ? According to the Act, any private sector organisation, where 15 per cent of employees are disabled, will get special government aid and the Provident Fund contribution of these employees will be provided by the government for three years. I think this is not sufficient and hope that the new Act that is forthcoming will have better provisions for private sector involvement in the welfare of the disabled. There is a demand for bracketing persons with disability in the BPL category. Is it likely to be conceded ? I have suggested for BPL category to persons with disability, and excluding them from the creamy layer. There are several grey areas in the existing Act, which would hopefully be addressed in the Act that is forthcoming. Picasso, Raza recalled in an interview, had famously said that it 'takes 50 years for people to start paying attention to your work'. In his own case, Raza quipped, it took 60 years. The small town boy, from Mandla in Madhya Pradesh, went to France on a scholarship, married a fellow student and stayed back there, carving out a place for himself in the art capital of the world. Even at this age, he remains remarkably alert and is striving to put up a centre for art, close to Delhi. The Raza Foundation set up by him already provides scholarships to artists, painters, dancers and poets. " Art is not a waste, it is another excursion of the mind," he says. He has often expressed his desire to return and settle down in India, partly because his wife and companion is no more and partly because of his irritation at the high rate of taxation in France. But conditions in India leave him cold. " Here, records( of artistic works) are rare, museums are few, books on contemporary art do not exist," he fumes before pointing out that officials at Indian embassies abroad do not promote art as vigorously as Chinese embassies are known to do. His father, Syed Mohammed Rizvi, was a Deputy Forest Ranger and Raza spent his early years in close proximity to nature. He grew up close to the Narmada river and surrounded by Satpura and Vindhya mountain ranges, dense forests, birds, animals, tribal life and mythology. Noticing that young Raza was unable to concentrate on his studies, his elementary school teacher drew a bindu (dot or circle) on the black board and asked him to concentrate on it. The bindu signified full concentration and his rebirth as a painter. It recurs as a metaphor in his works. Raza studied painting in the Nagpur School of Art and J J School of Art, Bombay. He owes his elementary values of art to Baburao Athawale, his teacher in Nagpur. Raza married in 1959, Janine Mongillat, his fellow student at Ecole de Beaux Arts in Paris, who later became a well-known artist and sculptor herself. At the request of Janine's mother not to leave France, Raza choe to stay there. Janine died on April 5, 2002 in Paris. There had been tragedies in Raza's personal life; the year 1947 particularly proved to be tragic. First his mother died. A year later his father passed away at Mandla and most of his family members-four brothrs and a sister migrated to Pakistan.